No line copic colouring! First time! I have a special card to share with you. I played with Penny Black’s new release stamp set today and attempted no line copic colouring for the first time. I am pretty happy with how it turned out. Here is the card. 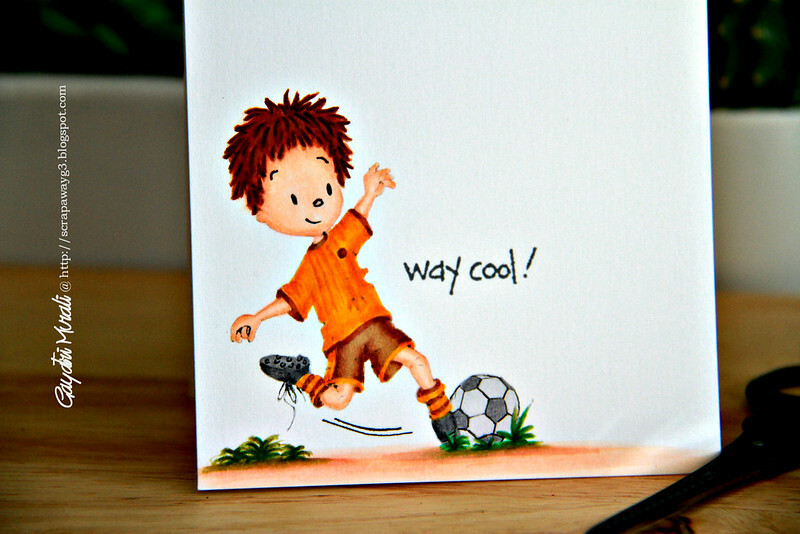 I stamped this cute image of the boy kicking the soccer ball from Way Cool stamp set from the new release Penny Black using second generation Flannel Gray memento ink. Then coloured with copic markers. Because the stamped image is second generation grey, the outline is so light that it blends with the colours. I have used copic fineliner to highlight some areas like the facial features, the ball, boots, lace etc. Here is a closeup! This is a one layer card. I liked it as it is and so I did not add any pattern papers or embellishment to the card. Not bad for the first time attempting no line copic colouring huh! This is the Way Cool stamp set from Penny Black I have used on my card. This is a technique that I struggle with, but you've nailed it here Gayatri. Now I'm convinced you can do anything. If this is your first attempt at no-line watercolor you obviously don't need any more practice. Wow! OMG! This is fabulous! It inspires me to give it a try! I think no-line coloring likes you!!! Thanks for sharing!! Oh my goodness! This is terrific!